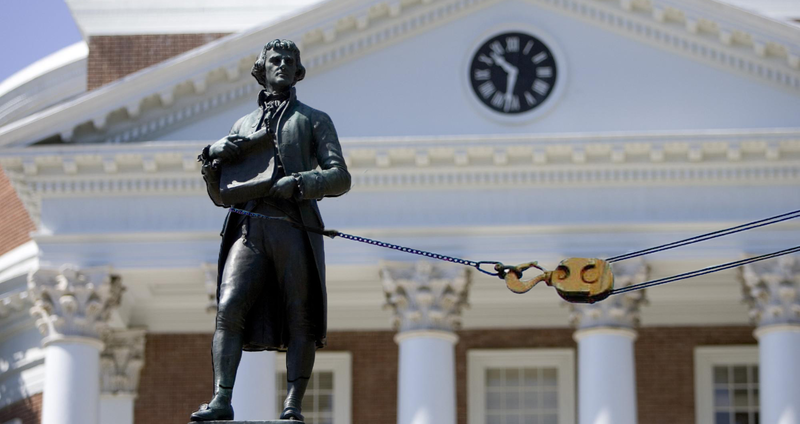 CHARLOTTESVILLE, Va. — Following the Cavalier’s triumph in the NCAA tournament final last night, officials at the University of Virginia have announced plans to replace the statue of university founder Thomas Jefferson with one of men’s basketball coach Tony Bennett. Help support our mission to bring you localized satire by joining our Patreon. “Tony Bennett has brought the school and the city of Charlottesville together unlike anyone before him,” James E. Ryan, the university’s president, said in a statement, noting that accomplishments such as being the primary author of the Declaration of Independence and being the third president of the United States didn’t compare to winning a college basketball tournament. “We think it’s what Jefferson would’ve wanted, too,” he added. Ryan finished his statement by adding that a statue of team shooting guard Kyle Guy was also in the planning process and will be placed in the heart of the Lawn later this year. We don’t produce UVA merch, we do have some authentic Peedmont merch.